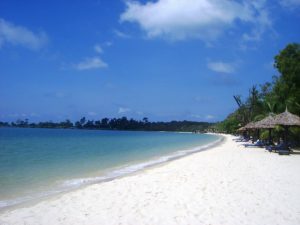 Love Sihanoukville – Everything you need to know about Sihanoukville in one place! Everything you need to know about Sihanoukville, in one place! Sihanoukville is a beach resort on the South coast of Cambodia. The peak season here is between November and March, when the sun shines everyday. Low season is between July and October, as although it is hot and sunny, it also the rainy season. The local currency is Cambodian Riel, but everywhere accepts American Dollars. There are a wide variety of activities to do in the daytime and evenings. From relaxing on the beach, to quad bike tours, Sihanoukville has something for everyone. Sihanoukville has plenty of good restauraunts, serving all sorts of food, and at very reasonable prices. The nightlife is one of the main reasons younger tourists visit, as there are many beach bars and clubs in the area, and the islands Koh Rong and Koh Rong Samloem are only a short boat ride away. There are around 8 or 9 beaches in Sihanoukville, and they are all easily accessible from downtown Sihanoukville. Some are busier than others, with bars and restaurants lining the beach and hawkers selling food and offering massages, while others are much quieter and more relaxed. There really is a beach to suit every type of person! Sihanoukville has numerous hotels and guesthouses, with more being built all the time to keep up with demand of tourists visiting. From $5 a night to $500 dollars a night, there is a room for all types of travellers. Sihanoukville also has around 12 Casinos which are always good fun for a night out, as minimum bets are as low as $2 and drinks and food are free! Here at Love Sihanoukville, we want to share with you the best places to stay, where to eat and what to do while your visiting Sihanoukville. Check out our website and we hope you have fun when you decide to visit Sihanoukville!